I headed over to Publix this morning with a pretty small shopping list. Part of that was because the deals just haven't been that amazing in the last few weeks, but also because I'm not stockpiling as much. Passover is coming up in two weeks, so I'm using up a lot of the bread and grain products I have in the fridge and freezer. (And I only have the one fridge with the freezer on top.) And I need to make room in one of my cabinets for matzah and other Passover products, so I didn't want to fill the cabinets with tons of boxes of cereal, crackers, and other non-Passover foods. 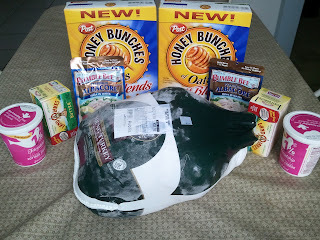 I did pick up a kosher turkey for my Passover seder, since there is now room in the freezer for it. Empire frozen turkeys are on sale for $2.29 per pound - stop gasping, that's cheap for kosher meat! I also picked up some dairy items and just a couple of other great deals. I hear ya about needing to slow down on the stockpiling! good job on the savings!